Lighting Papua New Guinea helps global solar manufacturers to enter the PNG market and bring off-grid power to a country where 6.3 million people (about 90 percent of the population) have no access to the national electricity grid. 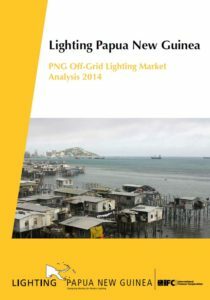 IFC works with quality off-grid lighting companies in PNG by providing business to business connections, market information and consumer education. In 2013, only 10% of Papua New Guinea’s population had access to the national electricity grid, leaving 6.3 million people without modern energy services. At the same time, mobile telephone coverage was growing rapidly, with 88 percent penetration rates. Digicel is an IFC investment client and the largest telecom provider in PNG. It has a 2.4 million customer base, of which 1.4 million live in remote and semi-remote areas. Digicel’s customers typically switched off their phones to conserve energy due to a lack of charging options, limiting use of Digicel services. With the support of IFC, Digicel responded to this challenge with solar charging stations. IFC helped Digicel to (a) develop the business model; (b) procure charging stations and (c) develop entrepreneur screening criteria (in short, entrepreneurs to manage the charging stations would be drawn from Digicel’s distribution network). 20 charging stations were deployed in 2013 as part of the pilot and by early 2016, 244 stations had been deployed. As a result of the program, phone charging and modern energy services have reached 975,035 people, just over 10% of the country’s population.